Industrial water supply, pressurized water using pressure vessels (autoclaves), various horticultural and agricultural irrigation applications, civil and domestic water transfer schemes, boiler and chiller and refrigeration systems. 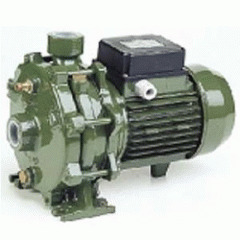 Pump suction, discharge body, also motor support in cast iron. Rotor shaft in steel fitted with seal for life bearings. 230V/400V-50Hz three phase up to = 4 kW, 400V/690V-50Hz for powers > 4 kW. - Liquid quality required clean free from solids or abrasive substances chemically non aggressive. - Maximum working pressure 10 bar. The tolerances of the hydraulic features are according toUNI / ISO 2548-Class C, Appendix B, electric features according to C.E.I. Manometric suction lift of 8 meters with a foot valve, for a suction of above 5 meters it is advisable to install the suction pipe with the internal diameter larger than the pump inlet.